Oct 20 - Philadelphia, PA - Today, FASTPORT Co-Founder Jim Ray revealed The Qualifier™ and JobChat™at the ATA’s MC&E Conference. These expansions to JobMaps™ technology will enable carriers to not only reach more drivers but also to pre-qualify the best matched candidates and communicate with them instantly. Jim unveiled the new products during his talk titled “Dirty Secrets, Stealing Drivers, and Secret Weapons,” which generated buzz from attending carriers who are looking to grow their fleets in 2015/16. 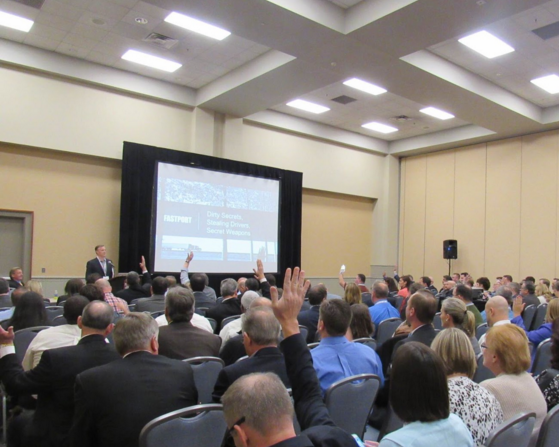 People anticipated the talk because Jim promised to reveal the trucking industry’s best (and worst) kept recruiting secrets that owners, executives, and recruiters use to grow their fleets and steal drivers. Jim also took advantage of the time to announce how the combination of JobMaps™, The Qualifier™, and JobChat™ form secret weapons that could improve the way our industry recruits online. Reach with JobMaps™: First, create your JobMaps™ that includes a map of your route/hiring area. Then, FASTPORT’s job sharing technology posts your JobMaps™ to cities and sites within your hiring area or along your route, avoiding oversaturated markets. Filter with The Qualifier™: Second, set your quick application process to filter out candidates that fail to meet your minimum requirements. You set the filters, so you get only the candidates you want. No more wasted time with huge percentages of unqualified candidates. Communicate with JobChat™: Third, talk with candidates the instant they are interested in your posting or company via their computer, SMS or phone. The system is queue-based, which means you determine which recruiters receive chats and in what order. But here’s the best part: because you’ve set up your filters, you will only chat with candidates who meet your minimum requirements.